Lion Geyser, in the Upper Geyser Basin of Yellowstone National Park along the Geyser Hill boardwalk, was a lucky happenstance for me. Lion Geyser, part of the Lion Group which includes a few other geysers, is difficult to observe since it is not one of geysers that the Park rangers predict. Lion Geyser has a relatively complex eruption timeline, involving major and minor eruptions that themselves occur with their own subintervals, steam phases and a rather long and unpredictable primary interval that lasts six hours to over a day in many cases. This hints at the convoluted nature of the subterranean plumbing and geothermal forces which drive the Lion Group. Lion Geyser was not even on my list of geysers to try to see this trip. However, I had just come from a wonderful eruption of nearby Grand Geyser and was walking the Geyser Hill trail for an hour before returning to Riverside Geyser to end the day, when Lion Geyser went off just as I was passing by. A pleasant woman with a European accent and I were the only two people fortunate enough to be near Lion Geyser as it gushed. We stood there quietly enjoying the show and taking pictures and video, listening to the unique roaring sound for which Lion Geyser is named. 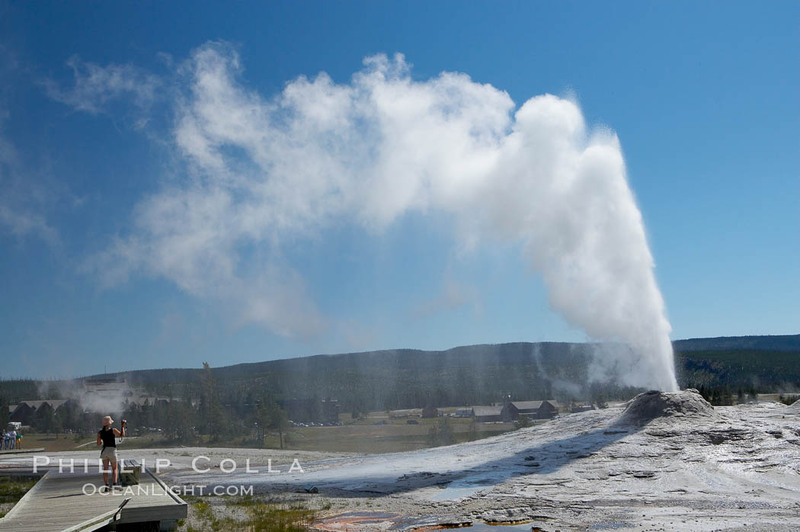 Keywords: lion geyser photos, yellowstone national park.